Sourdough bread is something of a wonder. I remember certain times throughout my childhood when my Mom would be gifted a little bit of starter and have a run of bread making. Oh, the goodness of a warm toasted slice of homemade sourdough smeared with butter. Mmm, mmm, MMM! My bread making adventures up until now have mostly consisted of a little flour, sugar, baking powder, salt, butter and a can of beer. (Ahem – for the BREAD, of course!) Now, don’t get me wrong. I love me some homemade beer bread, especially some of the flavor variations found over at Farmgirl Fare. But, I feel the need to move beyond the quick fix of a quick bread, and on to something a little more “crafted”. Sourdough it is. Since I don’t know anyone near me who happens to have any live starter on hand, the task of making it falls to me. For my first attempt, I found a recipe in my trusty Church Cookbook. This recipe called for water, sugar, yeast, and potato flakes. I thought this sounded a little strange, but I do remember this being the recipe my Mom used. So, I followed the recipe to the letter, feeding it as directed. After a few days, it looked okay, but had not really grown in size. 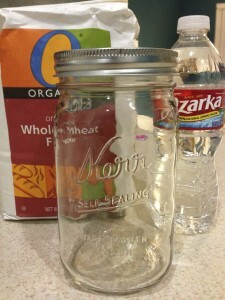 Then, I started actually researching sourdough starter. In hindsight, maybe I should have done that to begin with. After doing a good bit of reading up on what sourdough starter is and how it works, I tossed my original starter and began anew, following this recipe from the King Arthur Flour website. The only ingredients listed are flour and water. The yeast is already naturally occurring in the air, in the container, on your hands, etc, so there is no need to add extra yeast. According to the recipe, it should take from 5 days to a week to get a good usable starter. I’m looking forward to the process! 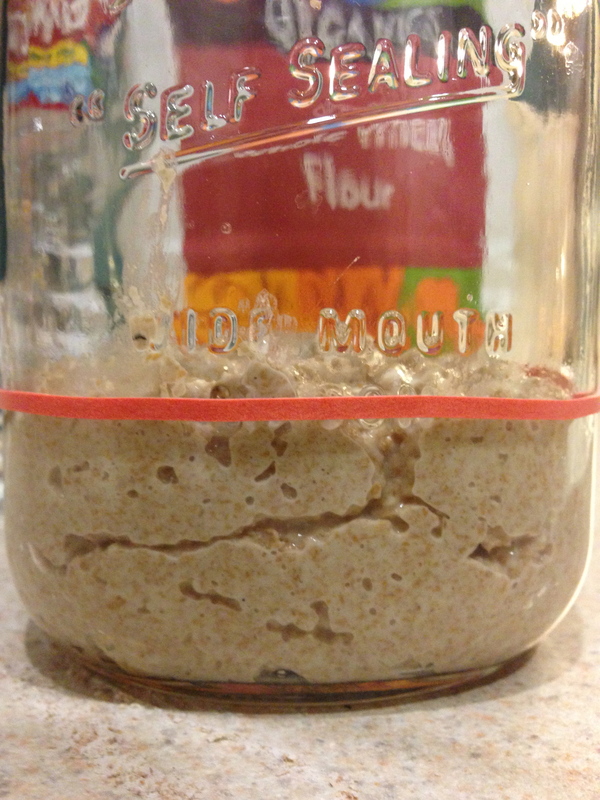 Day 1: Began starter at around 10pm, using whole wheat flour per instructions. I put a rubber band around the jar so that I can easily see any increase in volume. 3 Responses to "Sourdough Starter – Day 1"
The rubber band looks a good idea. I keep thinking about starting some sourdough but haven’t yet got around to it – I’m not sure we’ll eat enough bread to make it worthwhile. Thanks! My hope is to be able to replace the weekly loaf that I buy from the store with one that is homemade. The good thing about the starter is that once you get it going, you can put it in the refridgerator, which kind of makes it go into hibernation. So, it’s there when you need it, but you don’t have keep feeding it every day and baking bread every few days.